Keraflo have manufactured top quality, delayed action float valves in the UK for over 30 years. Their Aylesbury™ range is synonymous with float valve excellence with tens of thousands of products in continual use in demanding domestic, commercial and industrial applications throughout the UK and around the world. The Range of delayed action Float Valves are designed to provide an accurate and efficient method of controlling the level of stored cold water in tanks with or without raised valve chambers. All types of valve are constructed to operate over a long period maintenance-free. The delayed action results in full flow when demanded and positive shut-off when the desired water level is reached. This positive action is particularly beneficial for pumped systems and water treatment plants, as it minimises the time the pump runs against semi-closed valve head which is inefficient and wastes energy. opening and closing water level settings. The unique KP Twin Float Valve Kit specifically designed for twin tank/partitioned tanks. It uses KB delayed action pilot valve in each tank or division. As the water level drops which ever pilot valve opens first it actuates the main control valve filling both side simultaneously, whilst still giving the option of closing one tank or division and leaving the other side in service This is the only system on the market to achieve this. 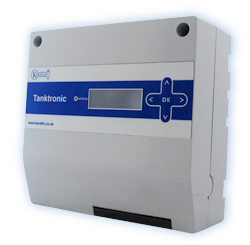 Keraflo has introduced Tanktronic, an electronic management system for coldwater storage tanks. The system provides a simple and intuitive solution that monitors water levels and temperature. Tanktronic also boasts a number of other additional options such as control tank filling, which provides optimum tank maximisation. The easy-to-use system, which is both affordable and quick to install, offers complete peace of mind for the end-user. The TANKTRONIC LEAFLET explains the product in more detail. With the new addition of the SERVO CERAMIC VALVE (SCV), which offers unique motorised filling of cold water storage tanks and the New TMU (Tank Monitoring Unit), which delivers remote real-time monitoring of water temperatures on 24/7 basis. The Aylesbury Float Valve is easy to install; with the 'up and over' discharge arrangement facilitating air gap requirements under the Water Regulation. The unique design and high quality of Keraflo Aylesbury float valves, which are manufactured in either brass or stainless steel, enables them to far outperform conventional ball float valves. WRAS states that the use of Delayed Action Float Valves help minimise the risk of stagnation in connected Cold Water Storage Systems. Have a look at The WRAS Regs here. If you are a specifier designing the water services or an installer fitting a water storage tank with or without pumps, in commercial, light industrial or other types of premises please contact Hurlstones for advice.